Workers on the new South Western Railway franchise are to vote on whether to strike in a dispute over the role of guards, the RMT says. The union said it wanted "a guarantee of a second, safety-critical member of staff on all current services". SWR called the dispute "unnecessary" - adding it plans to get more drivers and guards on its trains. 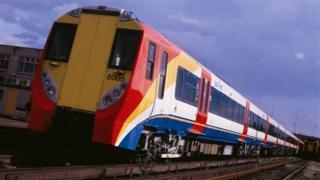 South Western Railway recently took over services that were operated by South West Trains. Their routes include commuters services in and out of London Waterloo. News of the strike ballot comes after travel in and out of Waterloo station - the UK's busiest railway station - was disrupted for several weeks over the summer while engineering works took place. Earlier this month, the boss of South Western Railway refused to commit to protecting the role of train guards. The union said there had been several attempts to try to get a "water-tight pledge" on the issue. RMT's general secretary, Mick Cash, said the union had "no option" but to declare a formal dispute after "repeated opportunities" were given to resolve it. Mr Cash added that the dispute could be resolved if South Western Railway were "prepared to stick to existing agreements" and ensure safety and access were the "absolute priority". "Guards on SWR have been hailed as 'legends' in company publicity material," he said. "It is time for First/MTR to stand by those legends and to withdraw the threat to throw them off the trains," he added, referring to the consortium of the First Group and Hong Kong-based MTR. A spokesman for South Western Railway said: "We have made it perfectly clear that we plan to retain a second person on our services as we know that our passengers value the assurance and assistance a second member of on-board staff provides." The franchise says it will provide more guards and drivers, adding it would work with the RMT to "deliver the best possible service".